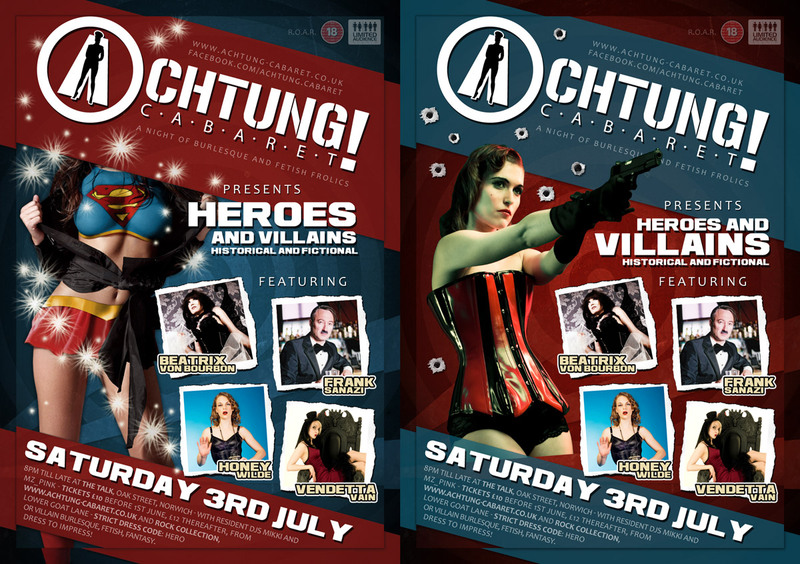 Tickets for our 3rd July heroes and villains event can now be purchased online from our tickets page. They are a very affordable £10 per person if bought before or on 1st June, and £12 if bought thereafter. The event will once again be held at the Talk, on Oak Street in Norwich, but we have moved from the Mulberry Suite to the much bigger main room. This has a much larger capacity, beautiful stage area, and air conditioning (very important for a summer event, as last year showed). Our theme is heroes and villains – historical and fictional, so get ready to do your best burlesque or fetish impression of Genghis Khan, Countess Bathory, Wonder Woman, Al Capone, Bonny and Clyde, or even that that guy with the bat obsession! Join our mailing list and keep up-to-date with Achtung! news. You are currently browsing the Achtung! Cabaret blog archives for April, 2010.